The new HD PENTAX DA 15mm F4 ED AL Limited replaces the existing smc PENTAX DA 15mm F4 ED AL Limited with a lens construction that is almost the same. The main difference is a new coating on the lens and better bokeh effect. 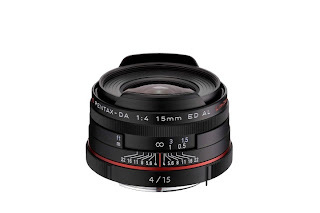 The HD PENTAX DA 15mm F4 ED AL Limited has gotten a new coating called HD coating. This is something a lot of camera companies are doing these days on their premium lenses. The coating on other lenses has proved to improve the image quality of the pictures, so I think you can expect the same here with the HD PENTAX DA 15mm F4 ED AL Limited. HD PENTAX DA 15mm F4 ED AL Limited also have gotten an improvement in the bokeh effect, which is how the background is shown behind the main subject as small apertures. This one of the main reasons why photographers are going for high end lenses. The existing smc PENTAX DA 15mm F4 ED AL Limited have gotten a rating of 75 at Pentax Index, which is considered to be one of the better lenses you can add to your camera. I expect that the new HD PENTAX DA 15mm F4 ED AL Limited will have a performance and rating that is close to this and my though is that it should get a better performance. The price difference between the existing smc PENTAX DA 15mm F4 ED AL Limited and the new HD PENTAX DA 15mm F4 ED AL Limited is not that big, so if you are going to buy this wide lens it is better to go for the improved new HD PENTAX DA 15mm F4 ED AL Limited. You can follow the HD PENTAX DA 15mm F4 ED AL Limited at Pentax Index, where I will collect reviews, articles and other interesting information as they come available from different Internet Sites. It is the easiest way to find a lot of quality, validated information about Pentax/Ricoh photography equipment.